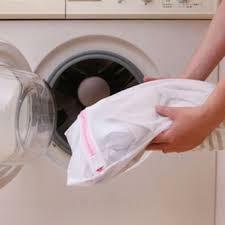 This laundry bag can protect the bra from twisting and damaging while washing together with other clothes. MESH LAUNDRY BAG - Choose the BEST to protect delicates, extend the life of lingerie, hosiery, intimates and more. DELICATES LAUNDRY BAGS KEEP COLORS SEPARATE & SAFE - The zipper periphery is helpful to avoid the clothes dropping out while washing. Model applicable to: automatic washing machine, semi-automatic washing machine, dehydrated machine, drying machine.